GRAFTON– From the moment he enters the water, Eric Bissell sings. There’s his rendition of “The Wheels on the Bus,” but mostly he sings Walt Disney classics. Eight-year-old Eric, who has cerebral palsy, made his wish four years ago, whether or not upon a star is uncertain, but it came true nonetheless. A month ago, Eric received a hot tub, courtesy of Starlight Children’s Foundation of New England. ThermoSpas donated the tub and Priority Electric provided the connection. Starlight Children’s Foundation is an international nonprofit organization with the mission to improve the quality of life for seriously ill children and their families. Among other activities, it grants the wishes of children between the ages of 4 and 18 who have chronic, serious or life-threatening illnesses. The New England chapter has granted 600 wishes to date. At least once a day, Eric splashes around his “Cinderella Pool,” named for his favorite Disney character. The hot tub was chosen from a wish list of Eric’s favorite things that included an all-day elevator ride and a day spent at a Disney Store watching Disney features on the store’s big screen television. 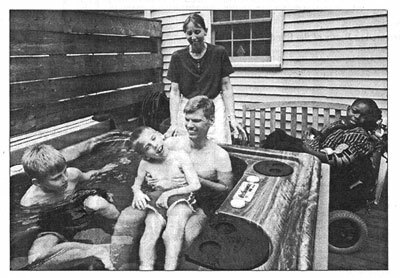 This hot tub is something Eric has hoped for since his fourth birthday, when he and his identical twin brother, Aaron, and his parents, Richard and Cindy Bissell visited Storyland in New Hampshire. It was their first time away from home, in a hotel, which caused Eric some anxiety. To calm his fears, his parents told him he was staying in Cinderella’s house. That night, he discovered the hot tub. He had seen and used regular swimming pools, but never a hot tub. The hot tub is as therapeutic for Eric as it is refreshing. In the pool, Eric, who uses a wheelchair, is weightless and able to move freely. Eric’s physician said the benefits of hydrotherapy also include increased breath control, improved balance and coordination, increased mobility and range of motion, and increased strength and endurance. The pool also has helped relax Eric’s muscles, which sometimes go into spasms. Before settling in for the night, Eric usually needs to take a muscle relaxant. But on the nights that he spends in the pool he falls asleep within minutes, without medication. “He just wades in the water and it relaxes his muscles,” Cindy Bissell said. “This is a wish that is going to keep on giving for years and years,” she added. Eric and Aaron were born 3.5 months premature with severe disabilities — Eric with cerebral palsy, and Aaron with damage to his trachea and windpipe from a breathing tube he needed as an infant. Because scar tissue blocked his airway, Aaron needed a tracheostomy, for the first four years of his life, which allowed him to breathe through an opening in his throat. In May, the Bissell family grew by one more. On May 1, Mr. and Mrs. Bissell adopted Anthony, a 9-year-old boy with cerebral palsy from New York City who had been in their care as a foster child since last year. Mr. and Mrs. Bissell have become resources for parents of children with similar disabilities. In 1996, they created a Web site (tracheostomy.com) dedicated to Aaron, to provide information about tracheostomies, and it has becoming a leading Web site on that topic. They also have developed a Web site for a local disability resource group, www.communitygateway.org. Information on the Starlight Children’s Foundation can be found at https://www.starlight.org.